I was dying to find out what this was all about. I recognized Charles Manson, but was that George Bush? Sigmund Freud? "I've had an extreme interest in serial killers since I was in high school ... I'm going back to school now ... for forensic psychology ... to do profiling ... 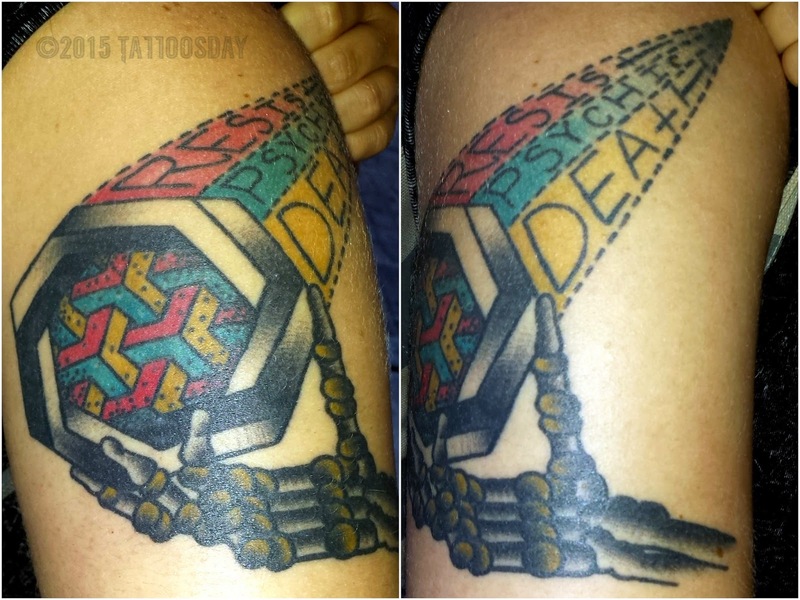 So I've always had a huge interest in it ... Down in Puerto Rico, when I was getting tattooed down there, I was talking with my tattoo artist and he'd never seen a piece that big dedicated to that [serial killers]." So who is in this Hall of Serial Fame? 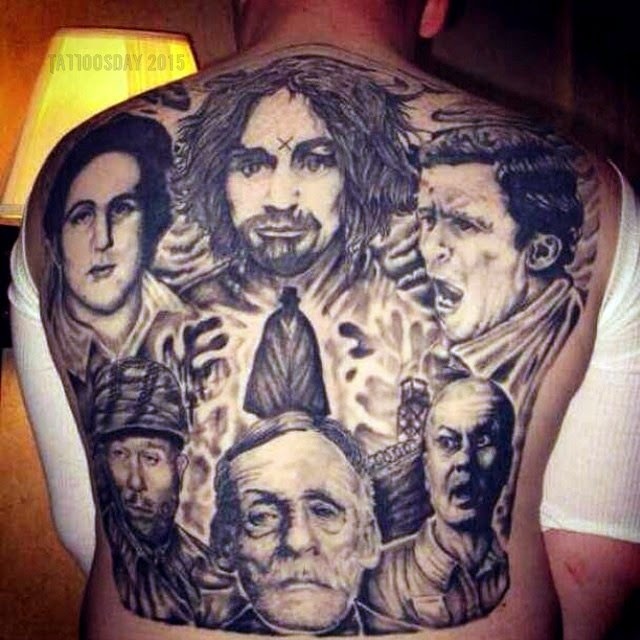 From the top left, going clockwise, we have David "Son of Sam" Berkowitz, then Charles Manson, then Ted Bundy (looking a little like George W. Bush), Andrei Chikatilo, Albert Fish (the one I mistook for Freud) and Ed Gein, with a silhouette of Jack the Ripper in the middle. Am I the only one who thinks that Ted Bundy looks like George W. Bush? "No," Jeremy told me, "I get that a lot." He credited the work to Blen167 from 167th AllStar Tattoo in Puerto Rico. Blen167 now works at Harisumi Tattoo. So how long did this take? Jeremy told me it was about one sitting per face, "so about 6 different sittings, 4-5 hours each, 35 hours total, not super bad." Jeremy recognizes that this might not be the most popular subject matter for a big tattoo piece, but he's committed enough to the study of the criminal mind that it seems fitting. It's definitely not work you see every day. I thank Jeremy for sharing this amazing back piece with us here on Tattoosday! Last summer I met Caroline on Broad Street, one morning before I was headed into work. 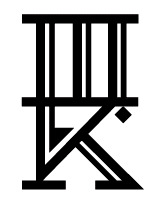 Caroline explained that this tattoo was done by an artist who goes by the name Tron who lives in Portland. "She's been a friend of mine for years ... we actually met on a music message board when I was in high school, like a Riot grrrl music message board ... I had seen her designs, I loved them, [and] I saw she did a page of flash for a convention that was all about the band Bikini Kill , which was one of the bands we grew up loving ... I had a taxidermy bird that I bought at a taxidermy shop years ago, I was trying to get rid of it, I could not get anyone to buy it - she [Tron] wanted to trade it for a tattoo, so it worked out perfectly, I traded her this ... I think it was a magpie, for this tattoo, and I saw the picture and I loved it and I actually emailed her about getting it a couple days later .. "Resist Psychic Death" is a Bikini Kill song and the rest of it was designed by her. I knew I wanted something, she kinda does something with those M.C. Escher-style impossible objects, and I was like 'Sure, just throw up [a] skeleton's hand, that sounds like it makes sense.' "
Thanks to Caroline for sharing this cool tattoo with us here on Tattoosday! UPDATE: On March 13, 2015, I wandered into Three Kings Tattoo's new location in the East Village and discovered Tron there. Her website is www.Losingshape.com and she can be found on Instagram here. Occasionally, friends text me photos of tattooed people. This is one of the benefits of celebrating people's body art. The gentleman did not want to credit his independent artist, but was willing to share. 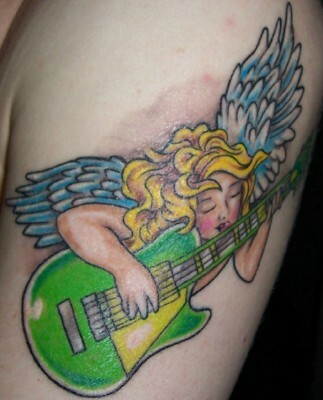 Thanks to Tommy for thinking of me and sharing this Brooklyn ink with us here on Tattoosday! 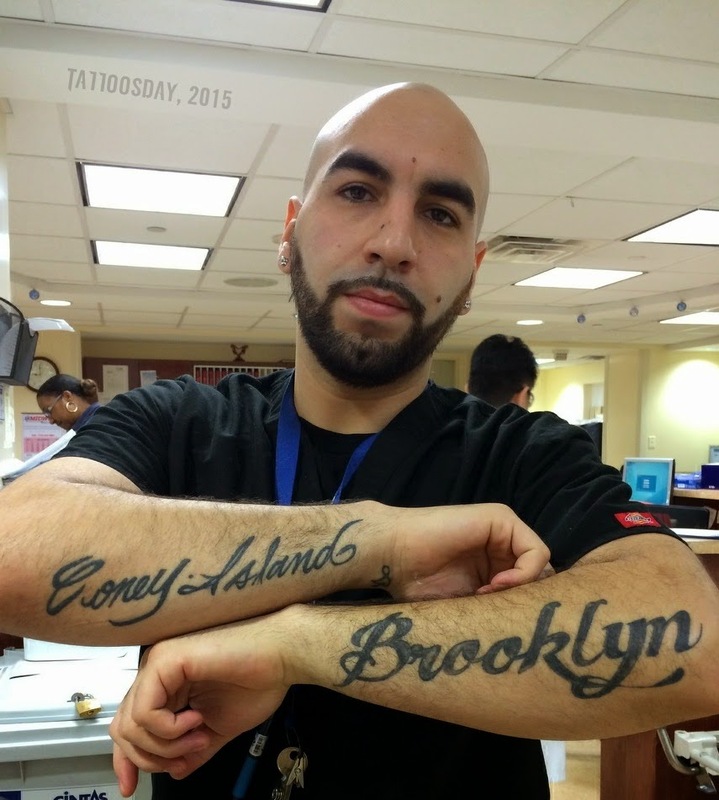 Last summer, while riding my bike along the Belt Parkway Promenade, I met Rochelle, who was kind enough to talk with me and share several of her tattoos. "It's a delphinium flower ... it’s like a bluebell ... almost, but they call it monkshood because, if you look at the flower it looks like a monk wearing a hood. It symbolizes usually death and ill-will, but a lot of people also use it because it symbolizes warding off evil and warding off death … I got it from Becki [Wilson] the day after my mother died, so now it has a huge amount of meaning to me ... Becki was at Greene Avenue Tattoo when this was done, but she has moved shops." 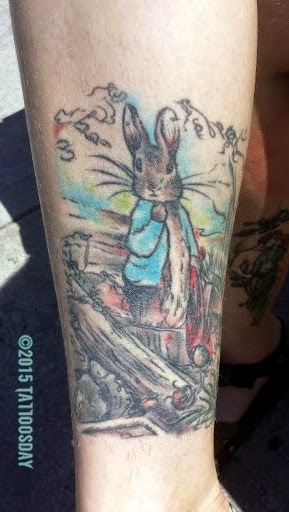 "I study tarot…this is my drawing and then Mike did a complete copy and ... he had done the rabbit first, and then I was like, I want you to do it like the rabbit with my drawing … so watercolor, sort of, so he faded out the inks, the symbolism of the tower tarot card is like chaos, destruction and rebirth." 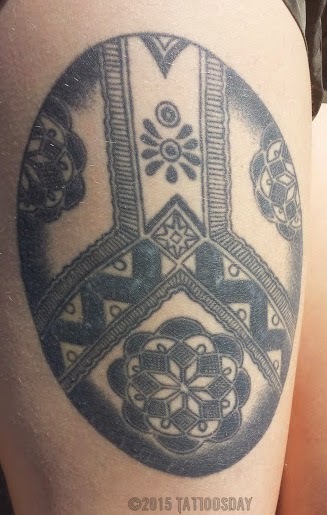 Thanks to Rochelle for sharing all of her awesome tattoos with us here on Tattoosday!